3. All vehicle manufacturers and importers to discontinue petrol guzzlers and improve fuel consumption by 10% per annum by building smaller cars each year. Plan and build electric vehicles for production in 5 years time. Please help! Our employers and governments will be influenced by strong public opinion. You can copy this letter and "Sustainable Futures" and send it to your employer or anybody, or copy the URL <http://www.users.on.net/rmc/sustainablefutures.htm> and send it around the world. With Solar Generators and Electric Cars. Climate Change has always been closer than we have realized and can be fatal, as the Norwegians found when the temperature dropped a mere 2 degrees and wiped out the colonization of Greenland, centuries ago. Today the earth is warming, the trade winds are shifting, causing the rain to fall further south, leaving the agricultural lands dry and sterile, with serious consequences not only to us but also the six and a half billion people across the world. In 600 million years there have been 6 Ice ages, followed by short periods with high temperatures. Ice cores drilled from Greenland and the Antarctic reveal the remarkable correlation between the CO2 level and the temperature. But 11,000 years ago a change took place, the temperature range which had been varying over at least 8 degrees now only varied by about 2 degrees, still sufficient to cause the little ice age but in general provided the equable climate that promoted civilisation. Why this change took place cannot be scientifically proved, but it could have happened because mankind developed agriculture and the use of fire. The particulates reflected sunlight preventing an excessive rise in temperature and the CO2 trapped heat, preventing a return to the ice age. Today our industries, homes, populations and transport systems are pumping out many tons of CO2 per annum raising the level of CO2 in the atmosphere. Fifty per cent of this weight remains in the atmosphere, the balance is absorbed by the trees and the oceans. That this absorption will continue is in serious doubt. Our increasing populations are stripping forests for building or wood chip purposes. Without water, trees will absorb less carbon. The oceans are becoming acid, detrimental to fish on which many peoples depend, again our increasing population leads to over fishing. The world fish catch peaked several years ago, and the threat to fish nurseries such as the Great Barrier Reef caused by rising temperatures is of great concern. A recent paper claims that CO2 concentration in the southern ocean has reached an upper limit, in which case CO2 will remain in the atmosphere, contributing to further global warming. 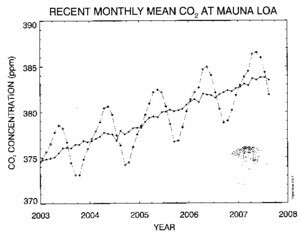 The graph shows the latest figures from the Mauna Lao Observatory in the Pacific. The trees in the northern hemisphere pull down the CO2 level during the growing season, but all year round we are using our cars and our air conditioners, the trees cannot cope. The average increase is shown by the straight line, and the peak reaches 386 ppm, well above the 286 maximums reached in the past 600,000 years. Industry and government have been installing solar panels, wind generators etc. but all their efforts have not slowed down CO2 emissions, which continue to rise because business is booming, population is rising and growth is the order of the day. Scientists are concerned that if we allow the level to rise above 450 ppm, the temperature will rise several degrees upwards, climate change will be permanent and agriculture will not be able to feed present population levels. Leading scientists are coming out with more urgent reports, saying "governments need to set targets." Most of our emissions come from burning coal to make electricity and oil for transport. 90% of these industries should be replaced by Geothermal power and concentrating solar thermal energy with heat storage. This is the real target. Sequestration will not capture enough carbon, will be too expensive and take too long to install. Coal interests should replace coal burners with Solar Towers and heat storage. The Kyoto proposals - which give a license for industry to continue to pollute, are not an adequate target. All industries should be required to provide annual plans to reduce their emissions by 10% pa by installing green power and Governments to provide planning, cooperation and finance. We should continue to install solar panels, Wind generators, tidal systems etc. But all systems must be checked for overall sustainability and low CO2 A law should be passed requiring all those who cut down a tree shall plant and water two more in the same locality. Skeptics should consider that we also have to face the problems of Population, Peak Oil and finance, to be briefly outlined in the following pages. A GREAT deal of your letters-to-the-editor last week concerned midwifery questions, and "IW" also published a two-page article chat about making babies with IVF. IVF should be abandoned and termination should be facilitated in the interest of limiting births to the minimum. Both sexes should be educated so that people who're unsure if they are suitable parents are not loaded with bringing up kids. At the other end, people who are no longer willing to live, can be given a drug to sleep eternally when required. We have to learn to live with less people, at least to the level of population at the beginning of the 1900s. If we are not, the population will contract sooner or later anyway. Most of our lives we drive a car to everywhere we want to go, we heat or cool our homes whenever we are in residence. When we die, most of us are cremated - the final insult to the environment. The solution could be "Natural Burial" where the deceased is returned to nature in a bio-degradeable coffin or shroud and buried in a field or meadow. A tree may be planted over the grave and the whole area returned to nature. Such places are available in Britain, in New Zealand and America. but not in South Australia. A Celebrant tells me that a cardboard coffin would not be legal here. However the SA Government appointed a committee to report on Natural Burial as a way of addressing the limited burial space in Adelaide and increasing open space. The committee was supposed to report back in Nov. 2006. As there are no recent reports on the web it must be assumed the result was in the negative. 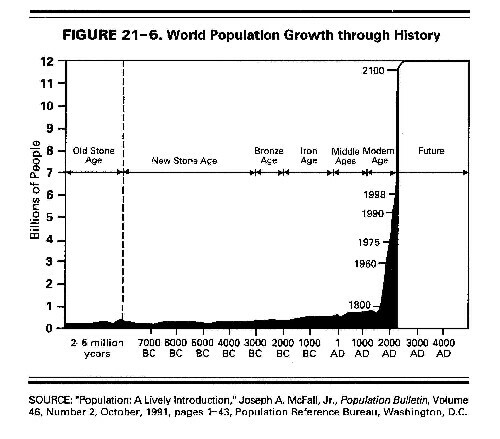 Last year, 2006, Professor Albert Bartlett of Colorado University, spoke at the Waite Institute giving his famous lecture where he proves, using simple mathematics, that population growth is unsustainable. You may hear or read this lecture by typing his name into Google search. Think of the place where you live. 150 years ago there was only one main street and two side streets. 100 years ago there were three main streets and a couple of suburbs. 50 years ago they were building bypasses and the boundaries were spreading into the next town and valuable agricultural land has been lost. This growth, which is taking place in most places in the world cannot continue. Grain stocks in most countries are down, the water table (in agricultural wells) gets lower every year. World fish catch is down, rivers are running dry. While many are living well now, this means that we are consuming the capital of the land and we will pay for that in the near future. If we do not allow population to reduce then the limits to growth will do it for us with tragic results. The remedy is quite simple, it depends on the observed fact that in developed countries where women as well as men have received a good education the fertility rate has gone down. Examine your own family tree, you will find less children being born to recent generations, this was noticeable before WW2. Another example is the low fertility rate in Italy in spite of the policy of the Vatican. All governments should ensure that all children, including girls, receive a good education and that the curricula include basic biology and family planning. They should examine their laws and reduce those that give subsidies to babies provided such reductions do not interfere with education. Subsidies should be redirected to monasteries. First world countries should subsidise education in third world states through the United Nations, which will be acceptable to all because the first world countries are causing global warming, and it is by education that most peoples can be pulled out of stagnation. The larger religions are most likely to object because their ideas were formulated when population levels were much lower than today. They will need to search for a new prophet and understanding of the situation. The media should be called on to commit to a world-wide publicity campaign in support of these ideas. D.C.
"POPULATION - Too many people, now and in the future, is the major environmental problem we face. Political and religious leaders who do not promote sensible birth control are creating hell on Earth." During the last 100 years we have built an advanced civilisation, mainly on the power of Oil. 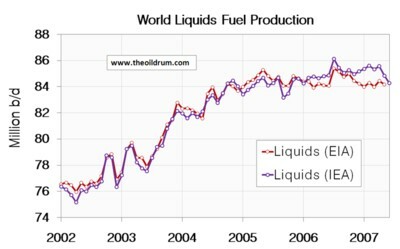 The graph from Drum Watch shows that oil production has reached a plateau, in 2 or 3 years it will start to fall and the price, already over $95 per barrel, (16/11/07) will rise. There are web pages which predict a rising production, this is unlikely as no large wells have been discovered recently, nor does it take into account the large number of wells in all countries reporting reduced production. We have a small window of less than 10 years to take remedial action. More oil is used in providing food than is used in our cars. We need agricultural machinery, fertilizers, pesticides and herbicides to feed the growing population, therefore we must stop burning oil in our cars and the larger part of our vehicle fleet should be replaced by 2020 with green cars.. Unfortunately our car manufacturers, who should know all about peak oil, have a poor record when they develop new models which are larger, heavier, faster and more costly than the previous model. They have built a few hybrid and electric cars but these are expensive because they use exotic materials and because they often use futuristic ideas, such as the Hydrogen car which will leak hydrogen, the effect on the upper atmosphere is questionable. The electric cars often use lithium batteries which do give a small car the performance and range of a petrol car, but they are expensive and there is insufficient lithium in the world to make this battery available to all. The way forward is (1) Enact a law which requires manufacturers and importers to make next years models 10% more efficient, (by reducing the size and weight of both engines and cars) repeating this process in every following year. (2) Set up a research and development unit for batteries and fuel cells. (3) Require all manufacturers to design and build an electric car within 5 years, using an executive team to include representatives from the factory floor. (4) Finance to be made available (see page 4) (5) Publish their progress on the WWW with talk back facilities for the general public. Motorists will complain that electric cars will not have the capacity or performance of today’s cars. This is correct, there is no power source that can beat oil for power and portability. We have to accept that the days of fast cars will soon be gone. Motoring authorities will have to consider what changes to the law are required to ensure safe roads for slower, smaller vehicles. It is anticipated that petrol stations will become charging stations where you can swap your discharged battery for a fully charged one and continue your journey. Australian manufacturers who complain that they can’t compete with overseas imports should consider the possibility of providing the complete package. i.e. make the car, two sets of batteries, a charging unit and a set of solar cells fixed on your roof for home charging and feeding the mains when not otherwise used. It should be realized that an electric motor is very efficient, has few moving parts and costs less to run than present day cars. Nuclear reactors. James Lovelock, author of the much recommended The Revenge of Gaia supports nuclear reactors but he is recommending the Tokamak, now being built in France, financed by 9 nations. It won’t be completed until 2040, and when completed won’t produce more than one coal power station and there are thousands needing replacement. Countries like France can make out a case for them but Australia has good geothermal resources and plenty of sunlight. Bio Fuels, can never be adequate to satisfy all demands. There will be less water to grow food for an expanding population. A case can be made to supply farmers in good areas with portable equipment to convert farm waste to Bio Diesel. Such units are on the market and will keep the tractors moving. We will need to give farmers maximum support. The development which this paper suggests is very extensive. It involves a complete makeover of our electrical generating plant and the replacement of all current cars. You might ask why should I buy an electric car in five years time? The answer is that the price of petrol will be so prohibitive that you won’t have any other option. This is a revolutionary change and while it will provide employment for all it also means that many projects will have to be postponed until the major changes to coal and oil plants have been completed . All new projects will have to be carefully vetted to ensure that they are carbon neutral and that they are carefully sited so they are accessible, do not cause bottlenecks, and do not make the costs of roads and services excessive. More scientists are speaking out, citizens everywhere are now convinced but we still have to badger our politicians and beware of those who recommend changes which are not effective. We may convince our politicians and industrialists to enact caps and targets on coal, oil and create alternative power systems, but if we do not also reform the financial system, we will fail. The world financial system may well be on the verge of collapse. Those who have done well, with a portfolio of class shares, will have difficulty believing this but they will be concerned at the recent dip in world markets due to the subprime loans in the U.S. and the dangerous levels of debt. The present system operates on the basis of Banks making loans and charging interest. The loans do not come from your bank deposits, they are created with a computer key. When paid back the loan is extinguished, that part of the interest retained by the banks allows ever larger loans to be advanced ensuring growth, required by increasing population levels. The system works reasonably well during the inflationary phase of the economic cycle, but as it is a system of Debt, growing exponentially to the extent that overall debt in many countries exceeds the G.D.P., the debt can never be repaid. This results in "corrections" and with only a little help from Global Warming, Peak Oil and Overpopulation we are heading for a depression which could mean financial ruin and mass unemployment for the majority..
Another objection to the system is that it could not have been better designed to make the rich richer, and the poor, poverty stricken. Also, the present system has reduced expenditure on the Public Sector, causing bad teeth, hospital queues, poaching doctors and nurses from countries that have a greater need, poor roads etc. As we are now approaching the limits of growth, we are changing from an expanding economy to a contracting one. The time has come when the world must agree to a more appropriate system. Banks, Financiers and delegates from business and politics should convene Conventions to investigate and recommend alternative economic systems. Many such systems can be found on the www. Many Bankers will consider it beneath their dignity to consider such systems. So we, the public, must take every opportunity to bring the serious situation we face to their notice. The minimum alternative solution which should be enacted is a Bill to enable all levels of government to spend three times the times the amount of money now spent on infrastructure. Such a Bill was introduced in the US Congress in 2004. It allows the Treasury to make interest free loans specifying the meaning of infrastructure and the financial limits depending on the population and other precautions. This Bill could be easily adapted to the needs of any country. Known as HR 4371, it has been copied for your convenience here. Will these proposals be successful ? No, not in our lifetime because it will take 100 years before the weight of CO2 will be reduced. This is why it is so important to take action now. Please pass this on to your friend, your MP, your Bank., also to overseas addresses etc. Copies can be obtained at local meetings or direct from the author. It is with regret that I conclude this paper with this subject but we are all concerned by the number of papers and reports coming over the Internet looking at the possibility of war with Iran and suggesting that there are people within the US administration working to ensure that we go to war against Iran. The war against Iraq has been a failure, based on false premises. A war against Iran is likely to have the same result. It will also generate many tons of CO2 and other poisons, bring us nearer to Peak Oil and make a real recovery impossible. In 2003 many people marched to Canberra to protest. Next time we need a protest 10 times as strong. D.C. Sorry, due to excessive spam I cant give you my email address, but you can use snail mail to 120 Goodman Road, Elizabeth South, South Australia, 5112.